This sounds like an ambitious project, and by the look of your pilot figures, you won't have any difficulty pulling it off. I look forward to following your progress! The elusive F-4B Phantom one of my long term projects. I really like the work you've done with the crew and seats looks awesome! I can offer what I've done and learned here if it's of any help. Very, VERY impressive start! I too have wanted to model the early VF-84 Phantoms, and will watch yours intently. You figure painting skills look quite good as well. Are the pilot figures still available? They look really good. Nice work on the seat and the pilots. The ejection handles look really nice also. Thank you for the warm welcome, help and the positive comments, really appreciated! 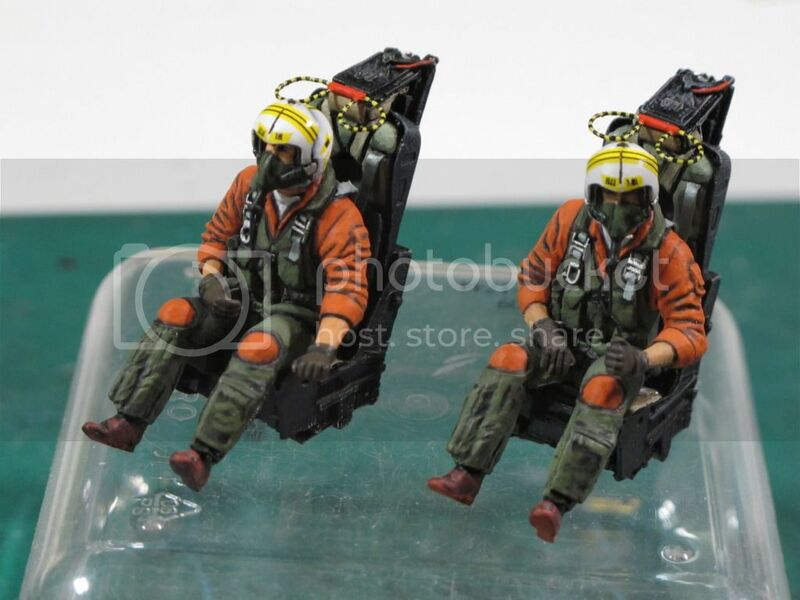 The resin pilot figures are still available, I got mine via HANNANTS mail order hobby store in UK, I also know that they are also available via PJ PRODUCTIONS own website, I believe they are located in Belgium? Both oxygen masks were modified slightly to make them accurate for mid 60's USN, the pilot's hands and arms are OOB and the RIO's hands and arms were re-positioned slightly by cutting and putting them in very hot water. 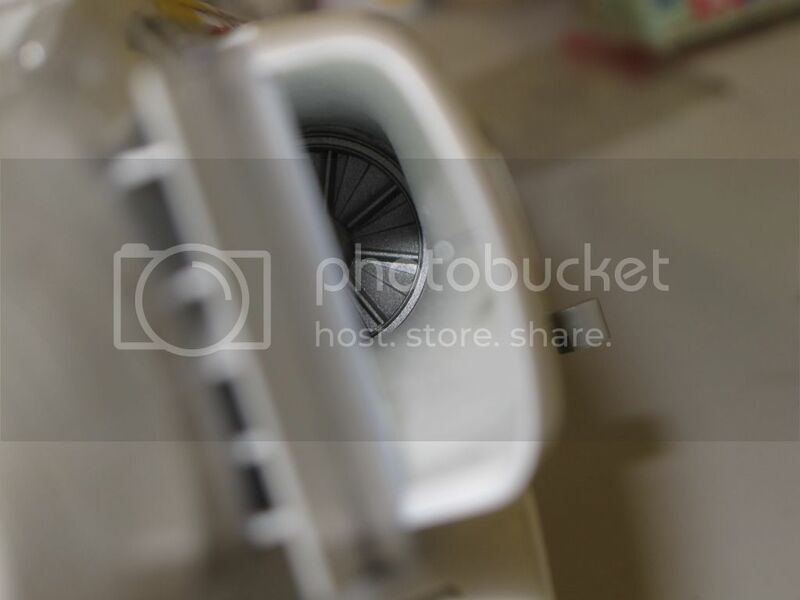 Just started fitting the D-Mold intakes, photos soon! Wow - those pilots look great! Can't wait to see more..
Great work! 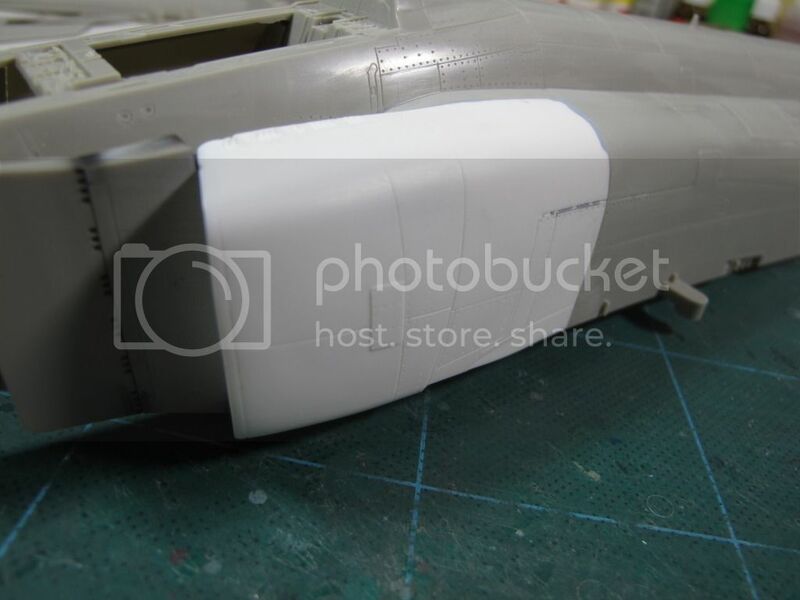 Check out Barry's F-4B build. There's a ton of good information in there. this is gonna be sweet.. i haven't seen a Jolly Rogers in that scheme yet, so it's a fresh perspective of VF-84. all those panel decals should be fun as well! Work on the pilots thus far is, uhm.. what's the word i'm lookin' for.. stellar? The D-mold resin intakes are on, they were easy to fit and needed only a small amount of Tamiya grey basic putty filler at the top corners, I've had unpleasant experiences with badly shrunk/warped resin before but this must have been taken into account when they were moulded, these are excellent!! Most of the panel lines lined up perfectly and I only needed to 'tweak' one on the port side to line it up, the joints were filled with the same putty and sanded and re-scribed after drying. 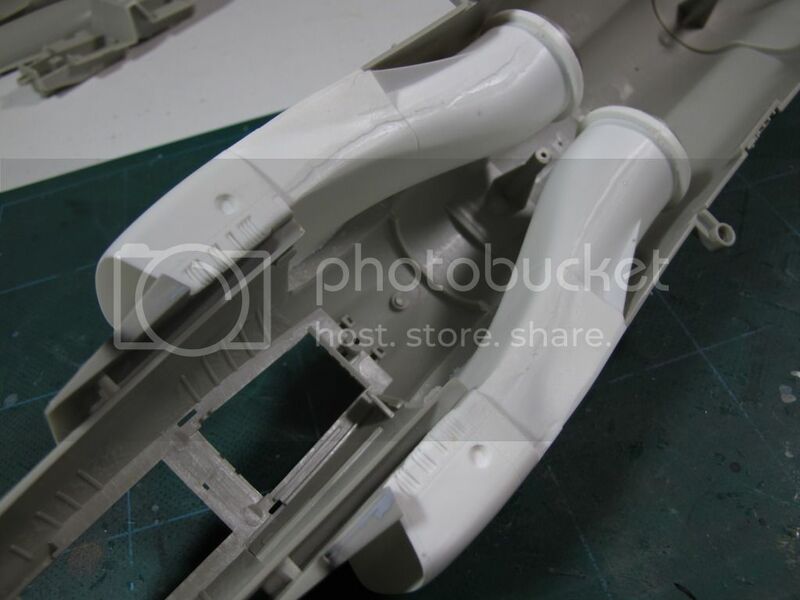 I also fitted the engine intake blades moulding which had been sprayed with Tamiya metallic grey and washed with Tamiya smoke. In addition, I also pre-shaded the internal intake wall behind the ramp with Tamiya matt black and oversprayed with Tamiya matt white as this bit is buried deep and will be impossible to reach at the painting stage. 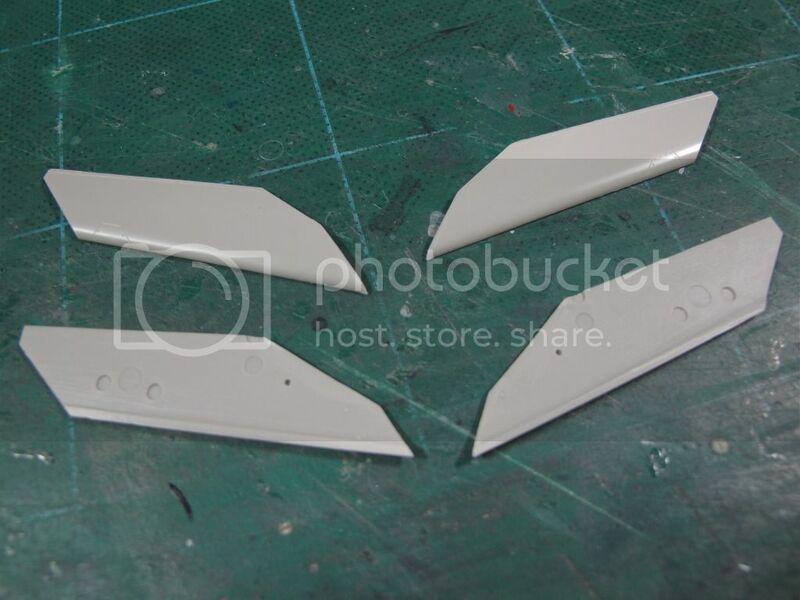 To practice cutting and filing, I cut out the upper and lower sections of the inboard leading edge flaps from the spare wing sections, these are ready to be assembled when I can gauge the thickness of the assembled wings. Next bit is cutting out the flaps/slats from the Cutting Edge set......sweaty palms time as they cost me lots of money!! In response to the last post fromladder4boy, I planned to put a few panel decals on just to give the impression that they are all there......I don't think I'll live long enough to put them all on! A good friend of mine once added every single panel decal to a 1/32 SEA F-4E from the Superscale data sheet which was available then, it took him around 8 weeks....he is still in therapy! I have the CAM decals sheet P32-021 which provides quite a few of the USN F-4 stencils. I do have a favour to ask of anyone reading this who can help, I could use a photo of an early F-4B rear cockpit, especially the panels (pre shoehorn, datalink and AIMS), I have a copy of the official manual but a colour photo would be really helpful. If you do not, you should have Danny Coreman's book covering Navy and Marine versions of the Phantom. 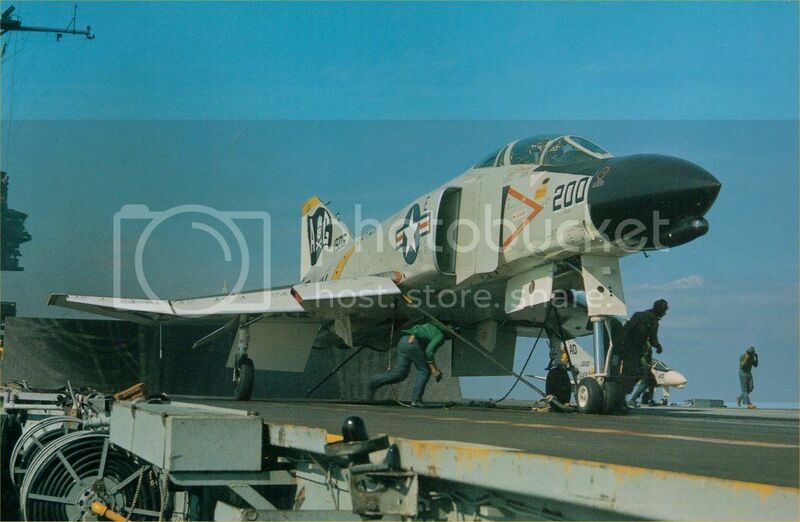 Tons of detail photos and for a single source for the F-4B/N/J/S there is none better IMO.